You'll be £14.99 closer to your next £10.00 credit when you purchase A Victorian Lady's Guide to Fashion and Beauty. What's this? Elegant cover with pastels of cream, pink and shades of sepia. Illustrated with coloured pictures, this incredibly informative book gives a good idea of fashion between 1840 to the end of the century. It provides information on clothing, varying activities for women of the time including horse riding, formal occasions and even what was worn on holiday. The restrictive and confining designs are a far cry from today’s fashions! Aside from the fascinating aspects of fabric choice, needlework techniques and research undertaken for the cosmetics available at the time, this book would make a brilliantly helpful research companion for writers and artists focussing on that era. If you want to dive into a new subject, but you’re not sure it’s going to be entirely for you, I’d recommend these types of short & sweet reads! The book is written so that it is palatable enough for someone new to this period, but also provides details from firsthand sources, like lady’s magazines and other material from the 19th century that provides a depth to the writing. Well researched and worth a read! Very nicely illustrated throughout, "A Victorian Lady's Guide to Fashion and Beauty" is arguably Mimi Matthew's best historical treatise/history to date and will prove to be an immediate and enduringly popular addition to both community and academic library English Victorian History & Culture collections and supplemental studies reading lists. There is no doubt that Victorian fashions are among the most elegant and fascinating of all the various periods in British history. Mimi’s book lays bare the secrets of how well-heeled Victorian ladies prepared themselves for social gatherings and engagements. Full of beautiful illustrations and a very readable text. Superb. This is so quaint and sweet, I love it. The illustrations of fashion and culture throughout the years is so neat. I have long held a fascination with Victorian times and everything related to them, so this book was a really fun read for me. It made me super grateful that I am able to slip on a pair of jeans! It is extremely difficult to walk the tightrope between a book for the casual reader and a detailed reference for writers, but Mimi Matthews has done it! Illustrated with period fashion plates and broken down into chapters covering decades, specialty clothes, cosmetics, and hairdressing, A VICTORIAN LADY'S GUIDE TO FASHION AND BEAUTY is an elegant resource that I will be reaching for again and again. This book provided an interesting account of Victorian fashions over several decades. I enjoyed the illustrations as they gave life to the very detailed descriptions. It was a lot of fun reading about the trends of that long ago time. As much as I love the fashions, I have to say I’m glad to be alive now rather than then! If you're interested in learning about the various fashion dos and don'ts of a stylish Victorian lady, this is sure to be a book you'll enjoy. 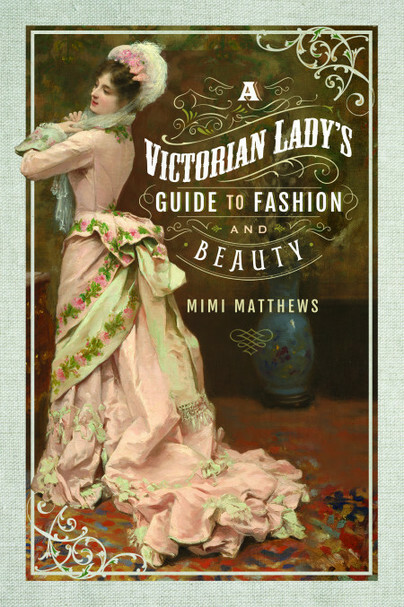 Beautifully illustrated and well researched, Mimi Matthews book, A Victorian Lady's Guide to Fashion and Beauty, will tell you everything you wanted to know about fashions of this time period. Sorted by decade, the complete ensemble—dresses, underwear, outerwear, footwear, hats, accessories, and jewelry—is described in minute detail in the first part of the book. I was fascinated with the description of each garment, but I would often stop reading for a moment in order to gaze at the illustrations. Great little book concerning everything to do with lady's fashion during the Victorian era. This is such a great read, brilliantly researched and fabulously engrossing. I love how much detail Ms Matthews has added to each part, her passion for the era is obvious and another thing I love is how she has sprinkled the whole book with passages and extracts from genuine articles and periodicals from the time. This is a very well-researched book and I can tell that the author really enjoyed the topic and writing it. For all those who are interested in the evolution of Victorian women’s fashion and the often secret beauty rituals of the age, I can wholeheartedly recommend this book. Though its tremendous wealth of information might not make for a book to finish in one go, it is however a most valuable reference. Moreover, those rich descriptions of what people wear in nineteenth century romance novels have come alive for me after reading Matthews work, and I can start to appreciate historical period dramas on a whole new level. This book has really enriched my experience of nineteenth century culture. This is an incredibly approachable reference book for laypersons and professionals. This will be a bible not only for lay enthusiasts but for professionals like historical recreationists, as well as film and theater costume consultants. Matthews has literally covered everything from accessories, desired silhouettes, hair care, acceptable color combinations and the correct fabrics and prints. She also covers the whole toilette, delving into how articles were purchased or made, the proper mourning attire, hair and beauty regimes, and correct hairstyles. I'm not familiar with the fashion terms of the period. I would have enjoyed more illustrations or more detailed descriptions for commonly used words describing parts of the dress or accessories, but I still found the book very interesting and informative. Decades of fashion is explained and supported with plenty of examples, such as the fashion etiquette of the day. I loved reading about the ways women washed and styled their hair in this time period. I will say, you really learn to appreciate the advancements in cosmetics and beauty supplies after finishing this book. I recognised Mimi Matthews' name as I recently read and enjoyed one of her books, The Pug Who Bit Napoleon, so I got quite excited to see she had another book out. A Victorian Lady's Guide to Fashion and Beauty is a thorough study of the world of fashion and beauty in the higher classes of Victorian society. There is so much detail, enriched by wonderful illustrations, that it all comes to life and you can just imagine what it was like. Anyone interested in the time period should pounce on this. I like how it's organised by decade, it makes things really clear. Not only does Matthews describe the fashion and beauty trends (hairstyles and cosmetics) of the decade, but she also explains the reasons for changes and what was going on in history at the time. Yet she manages to keep the whole thing entertaining and light despite basically bombarding you with interesting information. The extensive bibliography gives lots of ideas for those who might want to further research the topic - I admit I love going through the bibliography to see what else I could read. In my opinion, a good history book needs a bibliography. This is definitely a book I will eventually purchase so I can keep a hard copy at home. Interesting and well written however I would like to have read more about how many women would have actually been able to afford the clothes described. A delightful and informative read. Taking fashion and beauty in separate sections, the chapters moved from decade to decade, outlining the major fashions and changes during that period. The illustrations were helpful to demonstrate the different styles. If anything, I might have liked to have seen a few more included. Overall, though, this is a nicely presented, easy to read, quick guide to Victorian women's fashion, which will be of interest to history buffs and of great use to writers of historical fiction. This is a complete, fully detailed guide to women's clothing and beauty habits in the Victorian Era. Accompanied by drawings, it is an interesting and informative guide, which is a must-have for everyone interested in that era. A great introductory book to the world of Victorian primping. Clothing, hairstyles, and accessories are discussed decade by decade, and then by what was appropriate for different occasions. Hair and skin care are looked at, as well as cosmetics. Makes me realiase that while I admire the beautiful clothing, I certainly wouldn't want to live in that era! I like it as an addition to one's reference collection, and I also respect the author's attention to detail. A very good book, well written and well researched. It's full of interesting facts and clear explanation of how the Victorian fashion worked. The illustrations are very good. The book is really entertaining. Informative and enchanting together: the incredible variety of fashions and styles of the (Lunghisssimo!) Victorian period are clearly explained, and the wonderful fashion illustrations enrich an already splendid volume in itself. The book was a thorough and readable guide to Victorian high fashion. The topic of interest to me at the outset, I was very satisfied with the information I learned, both on fashion, materials, different stylistic epochs in the nineteenth century and some reasons related to these styles (for example, the role of the Crimean War ). Despite the presence of representative images, I think it would have been interesting to pay more attention to the details (for example, a stylistic of embroidery, leather goods or jewellery). Otherwise, I loved this book! USA Today bestselling author Mimi Matthews writes both historical non-fiction and traditional historical romances set in Victorian England. Her articles on nineteenth century history have been published on various academic and history sites, including the Victorian Web and the Journal of Victorian Culture, and are also syndicated weekly at BUST Magazine. In her other life, Mimi is an attorney. She resides in California with her family, which includes an Andalusian dressage horse, two Shelties, and two Siamese cats.